HONG KONG, China, January 8, 2017 (ENS) – Poached nearly to extinction in their homelands, rare and threatened birds and animals have found refuge in cities like Hong Kong, introduced to urban centers or wilderness areas outside their natural ranges. Now, the introduced populations could offer hope of survival for these rare species, say researchers from Hong Kong and Australia in a newly published study. “This is a key example of how Hong Kong – a heavily urbanized city-state – can play a role in the conservation of globally threatened species,” said co-author Ding Li Yong, from the Australian National University. The scientists identified 49 globally threatened species – classed as Vulnerable, Endangered, or Critically Endangered by the International Union for the Conservation of Nature, IUCN, on its authoritative Red List of Threatened Species – that have established introduced populations outside their native distribution. These include mammals, amphibians, reptiles and birds, as well as insects and plants, with introduced populations found on all continents except Antarctica. “Across the planet, poachers have reached into the last remote habitats to harvest wildlife populations used for clothing, eaten, or kept as pets in faraway cities,” said Dr. Luke Gibson from the School of Biological Sciences of the University of Hong Kong, who led the study. “In some cases, the traded organisms have escaped and are now thriving in their introduced habitats,” said Gibson, who studies deforestation and fragmentation and their impacts on biodiversity in the0 tropical forests of Southeast Asia. Simultaneously, augmenting declining populations in their native ranges and eliminating the threats to native ecosystems could “save two birds with one stone,” as Gibson puts it. “This creative tactic could be essential to save species imperiled by wildlife trade as well as eliminate threats the same species pose in their adopted territories,” he suggests. They give the example of the Yellow-crested Cockatoo, now classified by the IUCN as Critically Endangered due to capture for the pet trade. About 200 Yellow-crested Cockatoos – an estimated 10 percent of the bird’s global population – are found on Hong Kong Island, mostly between Pokfulam and Happy Valley. Many of these were pet birds that were accidentally or deliberately released into their new environments. 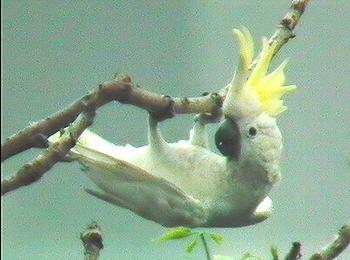 The authors, Gibson and Yong, suggest that harvesting the introduced cockatoos in Hong Kong could offset demand from the bird’s native range. 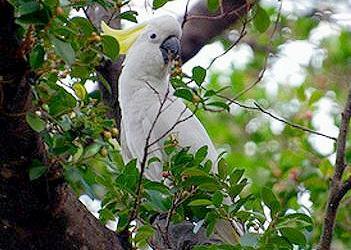 At the same time, they say reintroduction of this cockatoo to its native range in Indonesia and East Timor could help to support populations there, which are rapidly declining due to poaching. Both approaches could eliminate threats the introduced population might pose to native species in its introduced environment, such as monopolizing nesting sites and triggering population declines of local birds.